The second round of the NHL playoffs are due to start on Wednesday evening, after a doozy of a first round. I went a very terrible 3/8 in predictions, with some big upsets that no one saw coming. Namely, the fact that Nashville took out Chicago in a sweeping 4 games was something very few people would have predicted. Check below for some thoughts on the series, with predictions (probably bad ones, lets face it) on what is to come. Boston Bruins vs. Ottawa Senators – This is the one that hurt me the most. As a Bruins fan it was tough to see them go out in game 6. However, it was coming. The team was injury riddled and Ottawa was outplaying them on most games. There were some questionable calls from officials in this series that I really did not like, and hope it doesn’t continue throughout the playoffs. Also, this was a physically demanding series, and it makes me wary on how Ottawa is going to fare facing the Rangers in Round 2, but more about that later. Did I correctly predict this series? Nope. I called for a Bruins win. Washington Capitals vs. Toronto Maple Leafs – Had the Nashville win not happened, this very well would have been the most surprising series of the playoffs. Those rookie Maple Leafs certainly put up a fight. Had Toronto managed to go up 3-2 I think they would have taken the series in either game 6 or 7, but that was not the case. The Capitals took them out in 6 games but it was one hard fought series. By the end of it, you could tell the teams did not like each other one bit, and quite a few unnecessary penalties were called. Watch out for the Leafs next season, they should be one to watch. Did I correctly predict this series? Yes – Washington won. Pittsburgh Penguins vs. Columbus Blue Jackets – This is another series I found surprising. Given Columbus’ success in the regular season, I figured they would be a tough opponent in the playoffs, but that was not the case at all. Bobrovsky played a weak game, Marc-Andre Fleurry picked up his game, and well, the rest is history. Experience won in this series. Did I correctly predict this series? Nope. I called for a Blue Jackets Win. Montreal Canadiens vs. New York Rangers – Those Canadiens, they just can’t put together a solid Stanley Cup run. The Rangers won their series in 6 games, which may have been a bit unexpected, but Lundqvist has arguably been playing some of the best hockey of his career, and when he is on, he is ON. The Canadiens have a busy off season on the horizon, with Alexander Radulov and Andrei Markov unrestricted free agents as of July 1st, and with the potential for Carey Price to become unrestricted at the end of the 2018 season, they’ve got some work to do. Did I correctly predict this series? Nope. I did not. 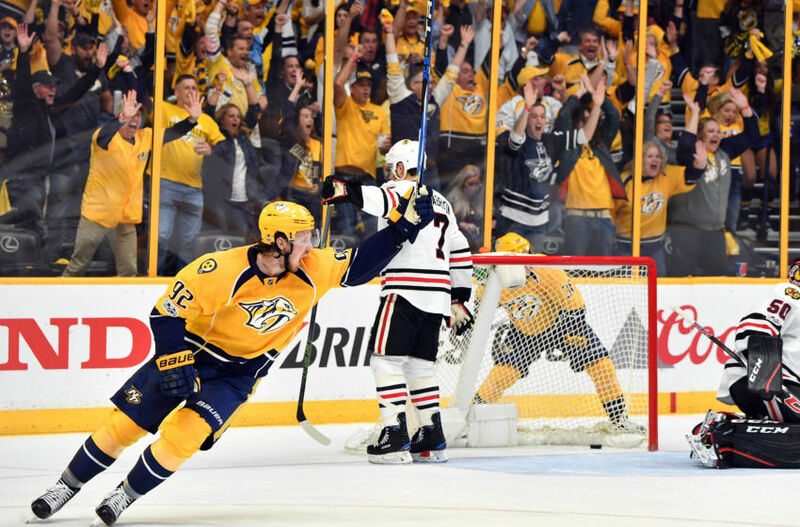 Chicago Blackhawks vs. Nashville Predators – This series was the shock of the playoffs thus far. The perpetual cup-contending Blackhawks ended up taken out, in a 4 game sweep by the 8th place Nashville Predators. It’s probably a series no one saw coming. Personally, I thought that Nashville could contend if they really wanted to, they have a stellar team with solid goaltending (both starting and backup). However, the sweep? Of Chicago? Shocking. Also, PK Subban mist be feeling pretty good right now, since no matter what, he’s making it further than his old team. Did I correctly predict this series? Hell to the no. St. Louis Blues vs. Minnesota Wild – I must admit, I did not watch one game of this series. As midwestern market teams, they played at weird times for me, and I had no vested interested in either, so this is a series that just kind of slipped through the cracks. Based on pre-season play, I thought Minnesota may have stood a chance, but again, experience won over and the Blues took the series. Did I correctly predict this series? Nope. Calgary Flames vs. Anaheim Ducks – This should have been a series that wasn’t a surprise to many. 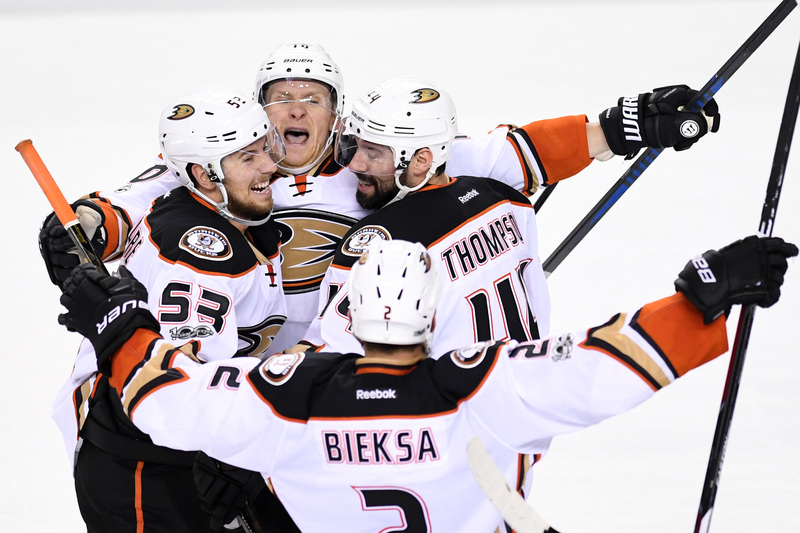 The Ducks core and goaltending overwhelmed the struggling Flames. It was an achievement for the Flames to even make the playoffs this year, they can have a decent future ahead, especially if they can get themselves some reliable goaltending. Did I correctly predict this series? Yes! San Jose Sharks vs. Edmonton Oilers – Those young Oilers, they can pull through when need be. It may have taken Edmonton MANY years to get to this point, but they’ve got a contending team for the first time in years. San Jose put up a fight, including one 7-0 win, but in the end, the fell in 6 games to the Oilers. It’s a bit sad for Joe Thornton, who’s a storied player yet to win a Stanley Cup. New York Rangers vs. Ottawa Senators – This has to be the Rangers series. Ottawa should have handily beaten Boston, but they had to fight for it. With the way Lundqvist has been playing, I don’t see any other outcome than the Rangers taking them out, probably quickly. Prediction – Rangers in 5 game. Washington Capitals vs. Pittsburgh Penguins – Two of the biggest stars in the game, Ovechkin and Crosby will be going head to head yet again. This is probably the series to watch in the second round. Although the history books give the edge to Pittsburgh in this series, I feel like it’s Washington’s to lose. However, how much the Leafs series took out of them remains to be seen. Nashville Predators vs. St. Louis Blues – With Nashville riding high off of their win against Chicago, I’m going to give them the edge in this series. If they can play like they did in the first round, they’re going to make for a tough opponent. Anaheim Ducks vs. Edmonton Oilers – This, to me, might be the toughest call of the second round. Both teams played well in the first round, and both teams have the players to carry them through the second round. However, given their experience and superior goaltending, I’m going to give the edge in this series to Anaheim, even though I wouldn’t be very surprised if it ended up going to the other way. There you have it! The first round in the books – will the second round bring us just as many surprises? Guess we’ll have to tune in to see.